Laminar flow cabinets are used in a wide array of applications in the pharmaceutical, medical, manufacturing, and scientific research fields. Laminar flow enclosures can be configured to provide vertical or horizontal airflow, depending on application needs. Each configuration is best suited to specific applications and provides a host of benefits. Horizontal laminar flow hoods are best for applications that require minimal turbulence on the work surface, making them ideal for use with primarily small utensils and equipment that will not cause airflow disturbance. Applications that require the utmost in contamination control should use horizontal flow because hands and gloves are positioned downstream of the sample during normal operation. Vertical laminar flow hoods are best for applications that require the use of large equipment on the work surface as the workspace is taller and larger with less turbulence caused by the vertical airflow. Vertical laminar flow hoods are often favored for many applications due to their resemblance of cleanroom setups. The airflow proceeds in a downward motion which, when coupled with the benefit of gravity, can assist in pushing particles down and away from the work surface and operators. When is a vertical laminar flow cabinet the best choice? Choose a vertical laminar flow cabinet when using larger equipment as the work space is taller and deeper. The air from a vertical flow hood goes back into the environment untreated so it only non-hazardous materials should be handled in the work zone. Biological safety cabinets must be used when protection of the user and the environment is required. There are several options of class and varying levels of protection available in BSC's. Class I Biological safety cabinets are designed solely for operator protection. Class II and Class III protect the product or specimen, the user, and the environment from contamination. Class II cabinets have open access to the work zone while Class III BSC's, often referred to as glove boxes, provides a barrier between the user and the work area. A class III biosafety cabinet is crucial for working with any biosafety level 4 agents, or other dangerous materials, such as aerosols of pathogens or toxins. Biological safety cabinet create a unidirectional laminar flow across the work surface following parallel patterns. But, laminar flow cabinets are not biological safety cabinets. 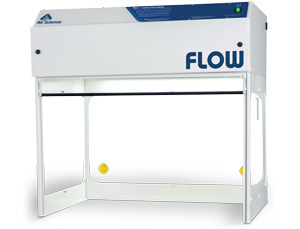 Laminar flow cabinets are configured to protect the work on the work surface. They do not protect the operator as the airflow pushes aerosols or particulates from the work surface toward the operator. Where biological safety is required, the Purair BIO offers a Class II, Type A2 NSF certification for personnel, work surface and environmental protection from airborne particulates and biologicals. This cabinet maintains a negative pressure inside the cabinet during operation to prevent contaminants from escaping the work area. The Purair BIO is ideal for life science researchers, various biological protocols, and for sterile product preparation in a number of industries. Incoming air is captured at the opening and passed through a HEPA filter. The air flows down to the work surface in a laminar flow pattern where it splits and re-enters the plenum, Here, 70% of the air is recirculated and 30% is passed through another HEPA filter to be exhausted to the room. Laminar flow cabinets are designed to protect the product or process on the work surface from particulates that are trapped in a HEPA filter. Available in vertical or horizontal airflow configurations. Biological safety cabinets offer added layers of protection for both the product/process on the work surface, the user and the environment. Available in vertical airflow configuration only. The cabinet must comply with NSF 49 Class II, Type A2 performance criteria for inflow, downflow, exhaust and cross-contamination protection. For assistance in choosing the right product for your application, talk with a technical sales specialist at Air Science or request a quotation.